Isn’t academic coaching just for students who are struggling? Any student can benefit from academic coaching. Some students might be struggling with specific concerns related to academic success, whereas others are doing well academically but find benefit in an outside perspective on time management, prioritizing tasks and study strategies and plans. What can I expect at my first academic coaching appointment? At your first meeting in the LAC-DS, you will meet with one of our senior staff members for 30-45 minutes. During that time, the senior staff member will make sure that you are directed to the best resources. All of our staff members see students for academic coaching appointments, but often students will choose to work with a graduate assistant in our office if more frequent or regular appointments would be helpful. What sorts of topics are covered in academic coaching? An academic coaching appointment will be tailored to your specific needs. Most common requests include time management, performance anxiety, study, reading, and note-taking strategies. We also can help with executive skills coaching and coaching related to other life areas such as sleep or healthy lifestyle habits. 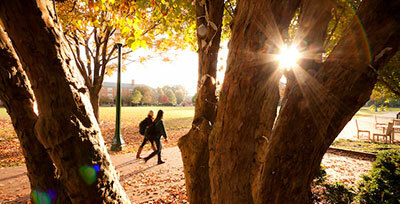 The best way to make an appointment is to stop by our office, 118 Reynolda Hall, located on Hearn Plaza (the “Quad”). Our administrative staff will help you make an appointment that best fits your schedule. Alternatively, you may call our office at 336-758-5929. We do not have email scheduling availability at this time. Who can make a peer tutoring appointment through the LAC-DS? The peer tutoring program is for any WFU undergraduate student seeking assistance (in subjects other than math or writing). Students must be enrolled in the course in which they are seeking tutoring. Students needing assistance in math should visit the Math Center. Students needing assistance for written assignments should visit the Writing Center. Why should I make an appointment with a peer tutor? All students can sometimes use a little help! 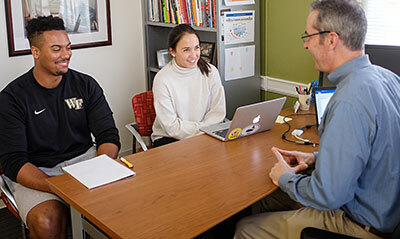 WFU students often seek out tutoring as a way to further develop knowledge in a particular area, develop stronger study skills, and progress toward academic success. Some students meet regularly with tutors throughout the semester; other students find that they need to meet with a tutor just once or twice to overcome an academic challenge. The LAC-DS offers tutoring in most subjects. However, availability of tutoring in specific subjects varies from semester to semester. When should I seek out tutoring? Some students find it beneficial to meet with a tutor several times during a semester; other students prefer to meet with a tutor before an assignment deadline or exam. If you feel like you could benefit from additional academic support, then the time is right! The tutoring schedule will be made available at the start of every semester. Students will be able to start making appointments during the second week of the semester through the last day of the semester. How do I get to meet with a tutor? You can schedule an appointment online. Click here for information on how to create an account and make an appointment. The LAC-DS peer tutors are undergraduate and graduate students from a variety of disciplines that excelled in their coursework and want to share their knowledge with others. They have an interest in helping others succeed academically and are interested in partnering with students to help them progress in their courses. The standard meeting location for peer tutoring is the Z. Smith Reynolds Library (circulation desk). However, some tutors decide to meet at our four other tutoring locations across campus: Benson University Center (welcome desk), Farrell Hall (Founders Living Room), North Dining Area (Starbucks), or Reynolds Gym (welcome lobby desk). The default location for tutoring (Z. Smith Reynolds Library) will appear on your appointment form in the WConline system. If your tutor desires to meet at one of the other locations, you will be notified via your appointment confirmation form. You will meet your tutor at the meet-up location (look for someone wearing a tutor button! ), and then you and your tutor will find a quiet spot to work. What should I bring to my tutoring sessions? That depends on what your specific needs and goals are for the session. It might be helpful to bring the course syllabus, assignment sheet, study guide, textbook, returned assignments/exams, or course notes. How long does a session last and how often can I meet with a tutor? Tutoring sessions are one hour, with a few minutes at the end for the tutor to draft a session report. To ensure that everyone has equal opportunity to our tutoring program, we limit students to three sessions per week, per subject. We expect that our tutors will give you their full attention, actively listen to your concerns, collaboratively set goals with you (both for the session and beyond), and help you work through your academic challenges. We expect that our tutors are knowledgeable in the area they are tutoring and come to each session on time and well prepared. Our tutors will not do the work for you. However, our tutors will partner with you, helping you become confident learners progressing toward understanding in your area of study. We expect that our tutors keep all sessions confidential, only speaking with the LAC-DS staff if there are concerns that need to be addressed. You will need to make appointments at least 3 days in advance. If it is at least 20 hours before your appointment, you can cancel directly through our online system by clicking on your appointment and clicking cancel. If it is less than 20 hours before your appointment, you will need to contact your tutor directly through the number listed on your appointment request form. What if I forget about my appointment and don’t show up? Our tutors will wait 10 minutes for you to arrive. After 10 minutes, they will mark you as a “no show.” After 2 no-show appointments, your account will be disabled, and you will be unable to make future tutoring appointments without permission from the tutor coordinator. If your account is disabled, you will need to contact the tutor coordinator, Laura Denlinger at denlinlc@wfu.edu. Will I get a good grade if I meet with a tutor? While we would love for you to get a good grade in the course, we are more concerned with the progress you make toward reaching your academic goals. What if I need help with chemistry, physics, or accounting? In order to qualify for tutoring in chemistry, physics, or accounting, you must attend at least three help sessions prior to receiving tutoring. Help sessions are organized by the department. Where should I go if I have a complaint or suggestion about the Peer Tutoring Program? You can contact the LAC-DS Tutor Coordinator, Laura Denlinger, with any comments or concerns. 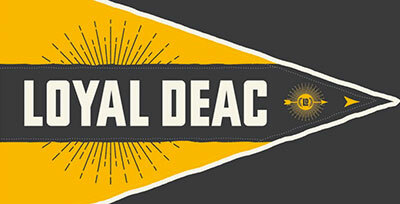 She can be reached at denlinlc@wfu.edu or 336-758-2137. As defined by the Americans with Disabilities Act of 1990 (ADA), as amended, and Section 504 of the 1973 Rehabilitation Act (Section 504), an “individual with a disability” is any person who (1) has a physical or mental impairment that substantially limits one or more major life activities, (2) has a record of such impairment, or (3) is regarded as having such an impairment. Wake Forest is required by Section 504 and the ADA to ensure that every student has meaningful access to all programs, services, and activities and to provide appropriate academic accommodations and services as needed. The Learning Assistance Center & Disability Services (LAC-DS, 336-758-5929, http://lac.wfu.edu) and Office of Academic Advising (336-758-3320, http://advising.wfu.edu) also work with students who have temporary impairments—such as broken limbs and concussions—that may affect them for limited periods of time to assess whether the students qualifies for reasonable accommodations. How will I know if a student in my class has a disability or a need for an accommodation? Students who need academic accommodations will present you with a personalized letter from our office that confirms the presence of a disability and describes the accommodation request. When will I know if a student has an accommodation need in my course? The LAC-DS encourages students to discuss their disability-related needs with their instructors as early as possible, and the goal is to have accommodation letters distributed to faculty within the first two to three weeks of each semester. Faculty members may not set an absolute deadline by which students must discuss academic accommodations (e.g. “within the first two weeks of the semester”). Instructors may expect students to request services in a manner that is timely with respect to the action needed (e.g. five business days before an in-class examination for extended test time). What’s the best way for me to provide the accommodation of extended time for tests and exams? 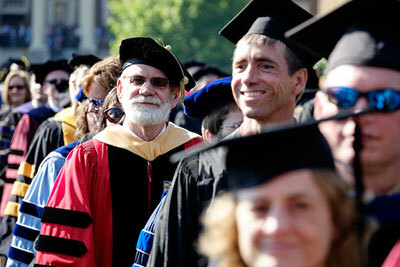 We encourage students to negotiate the logistics of the extended time administration with individual faculty members. Some students choose to arrive early and start the exam before other students, while others will choose to stay later to finish the exam. Alternatively, some students and faculty members choose to make arrangements with other space available in the department. Faculty members should select the room and assure that the circumstances of the exam are comparable to those in the main exam venue. For example, students in the separate room must receive announcements, corrections, clarifications, etc. comparable to students in the main testing venue, and should have the same opportunity to consult the instructor and ask questions. What if my schedule (or the student’s schedule) doesn’t allow for extending the time allotted for the exam? Limited space is available to proctor exams within the LAC-DS. Arrangements can be made by contacting our administrative coordinator, Wende Walker, in advance. However, it’s important to note that over 90 percent of extended time exams are proctored in academic departments. That way, students have access to the faculty member during the exam. What if I choose to give the entire class extended time? When a faculty member extends the length of a standard timed test or exam for all the students in a class, then the extended time for the student with a disability should be proportionally increased, according to that student’s approved accommodation for extended test time. For example, if the scheduled exam is 3 hours for nondisabled students, then the student with a disability receiving 50% extended test time would get 4.5 hours. If the professor allows the nondisabled students 4 hours to complete the exam, then the student with a disability should be given 6 hours to complete the exam. A student has told me that because she receives extended time on tests and exams she is also entitled to have extended time on out-of-class assignments like papers and projects. Is that correct? No. Accommodations for extended time apply to tests, exams, and timed, in-class assignments only. My final exam is part of a national administration (e.g., the American Chemical Society exam), and the exam is timed, on a computer. Do I still have to provide extended time? Yes. Extended time applies to tests given throughout the semester and to the end of the semester final exam. Arrangements should be made to provide an extended time accommodation. What about students who have a need for assistive technology in the classroom? Some students use technological services in class that may require the participation of their instructors, teaching assistants, etc. These could include assistive listening devices, real-time captioning, and video captioning. Similarly, some students have disability-related permission to use laptops for word-processing or to utilize specialized software, and some students use “smart pens” loaned by the LAC-DS. What should faculty members do if a student reports that he or she has experienced disability discrimination or has been denied accommodations? How recent does my documentation need to be? We prefer that your disability documentation be no more than 3 years old. More information, including specific guidelines for documenting various disabilities, can be found here. What if I think I have a disability but have never been tested? If you think you may have an undiagnosed disability, then you should consider scheduling an appointment with one of our senior staff members to learn more about your options. Please call 336-758-5929 to schedule an appointment.